Checking out Charles Web Debugging Proxy while I’m having a bit of a look under of the hood of SSL-Explorer. Snooping on an a SSL session works straight out of the box. Must be using a ‘man-in-the-middle‘ method to sit between me an the SSL website. Yet, when I access https://www.amazon.com via Charles Proxy I get a warning about the certificate. Viewing the certificate ‘certification path’ shows that the content coming from the proxy has been encrypted with a certificate signed by ‘Charles CA Certificate’. Left: without the proxy. Right: with Charles Proxy. I know SSL does protect itself against a man-in-the-middle attack – but I don’t know exactly how this works. There’s an SSL certificate on the server that’s been signed by a ‘certificate authority (CA)’ – and your browser contains public keys of the trusted CAs (IE: Tools -> Options -> Content -> Certificates -> Trusted Root Certification Authorities, Firefox: Tools -> Options -> Advanced -> Security -> View Certificates -> Authorities). How do these pieces fit together to protect against this attack? Hellman exponential to be authenticated. Posted by russ on Sunday, October 8, 2006, at 1:51 am. Filed under networking, web dev. Follow any responses to this post with its comments RSS feed. You can post a comment or trackback from your blog. Hi, I’m the author of Charles. I thought I could shed some light on this one! SSL protects from the man-in-the-middle attack exactly as you’ve seen it. 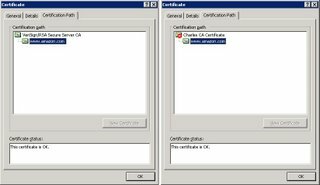 In order to observe the SSL communication (as Charles does so you can observe it too), Charles has to create a new SSL session with your browser and sign it using its own CA certificate. Unless your CA certificate is trusted by the browser you see a warning as shown, which is how your browser enables you to detect that something is wrong – in this case a man-in-the-middle. Because you’re expecting (hopefully!) the man-in-the-middle you can allow it.